On 16 August 2012 the summertime sun streamed through the leafy canopy of Green Park and into the windows of the Belgravia headquarters of platinum mine company Lonmin plc. But 5,500 miles away there was a chill in the air as the company’s biggest South African mine became a frenzy of activity. By nightfall, 34 striking miners had been shot dead and 78 wounded in the bloodiest security crackdown since the end of apartheid. As the country tried to make sense of the events, blame was apportioned to police, the unions involved and the striking miners themselves. But 15 months on from the massacre, executives from British-owned Lonmin, which counts the Church of England Commissioners and several UK borough councils among its shareholders, have not yet been called to appear before the official commission of inquiry into the massacre. Now, evidence examined by the Bureau of Investigative Journalism raises new and potentially damaging questions about the relationship between Lonmin, the company at the centre of the strike, the police and the government. A transcript of a meeting between Lonmin and police submitted to the inquiry suggests company officials worked with police chiefs to formulate a joint plan to break the strike. The investigation has also found that company executives lobbied politicians and police chiefs to ramp up the police presence and that the company provided resources and intelligence to the police. The research has also shed light on the political and financial pressures that the company was facing at the time. Lonmin grew out of mining firm Lonrho, the company that owned the Observer from 1981-93. In 1999, Lonrho was renamed Lonmin. Earlier this month the company announced its end-of-year results, recording a profit and increased production for 2013. The company came to international attention last year when the week-long strike came to its bloody climax. 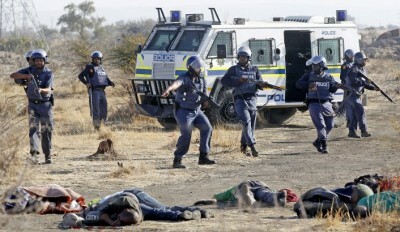 There is no suggestion that either the police or Lonmin officials intended for shots to be fired that day. However, evidence now shows that on 14 August, just two days before the massacre, there was a joint agreement between the company’s management and police that the strike should be broken in a decisive manner. The details of this meeting have only just surfaced. A transcript submitted to the commission shows provincial police chief Zukiswa Mbombo in discussions with three Lonmin employees, including head of security Graham Sinclair and executive vice president for human capital Barnard Mokwena. In the meeting, the group discuss the political and industry pressures influencing the situation. The group also discuss a similar strike that had happened at another South African-based mine, Impala Platinum, six months earlier. There the strike resulted in the company giving in to workers’ demands for a wage increase, and the establishment of a new union at the mine, the Association of Mineworkers and Construction Union (AMCU). Lonmin’s chief executive at the time, Ian Farmer, attended a presentation by Impala in which they discussed what had happened. Farmer told the Bureau that Impala’s agreement to a wage increase “rippled through the rest of the industry and “created an expectation”. In the meeting on 14 August, Mbombo notes that Lonmin should learn lessons from Impala, and take care to not look sympathetic to the AMCU rather than the established union, the National Union of Mineworkers (NUM) – which was an ally of the African National Congress. At the meeting a plan is formulated that Lonmin will issue an ultimatum to the miners to return to work or be fired, and if that does not work the police will move in to break up the strike. Mokwena agrees and tells her: “The two plans go together”. Mbombo then assures Lonmin’s head of security, Sinclair, that she can provide him with a water cannon. There had already been a number of violent incidents at the mine in which strikers, police and security personnel had been killed. On the morning of 16 August, ambulances were put on standby by Lonmin and attempts were made by the police to order mortuary vans. The police waited until the miners had amassed at the rocky hillside that had become their base before rolling out razor wire and opening fire. Evidence shows the water cannons were used just seven seconds before live ammunition was fired. The meeting on 14 August arose after a concerted effort by Lonmin to get the police interaction that they wanted. Acts of intimidation and violence had been bubbling up even before an official strike was called and emails, telephone calls and a letter between top Lonmin executives show the company lobbying politicians and police chiefs to increase police pressure. Three days before the massacre, Albert Jamieson, the chief commercial officer of Lonmin, wrote to the minister for mineral resources, Susan Shabangu, and asked her to act more decisively and to “bring the full might of the state to bear on the situation”. The mining sector is important to the South African economy. In 2012 it brought in $21bn, or 5.5% of GDP and 38% of all South African exports. The message got through. Ramaphosa later noted that Shabangu “is going into cabinet and will brief the president as well and get the minister of police Nathi Mthethwa to act in a more pointed way”. In a statement to the commission of inquiry dated 30 May 2013, Ramaphosa said his engagement with government officials served to inform them of the gravity of the situation in Marikana. Ramaphosa has since left Lonmin and become deputy president of the ANC. Political analyst Adam Habib points to the importance of his role in the affair. “Cyril Ramaphosa’s emails don’t demonstrate he’s responsible for the massacre but they do suggest Lonmin had used his office to get access to ministers and security officials in a way that would not otherwise have been possible,” he said. Between the sending of Jamieson’s letter on 13 August and the follow-up emails and lobbying two days later, the number of police on the Marikana site more than tripled. Reports of violence and intimidation had been coming in to Lonmin security in the weeks before the massacre. In the week leading up to it, two police officers and two security guards were killed. Six miners were also killed, four of them shot by the police. In public statements, Lonmin announced it had handed control and responsibility over to the police. On the day of the massacre, the chairman of Lonmin sent out a statement saying: “The South African Police Service have been in charge of public order and safety on the ground”. However, Lonmin had more than 500 contracted security officials working for them. Police officer Charl Annandale told the Farlam commission – the inquiry set up to investigate the massacre – that during the strike, the police “relied on their [Lonmin] feedback … they had literally hundreds of security officers spread over their site that gave us valuable feedback”. In earlier days, informants among the striking miners had fed back information to Sinclair, the company’s head of security, according to written statements to the commission. Lonmin supplied CCTV, helicopters, jail cells and ambulances to the police operation. Lonmin staff also had access to police radios and logged information received on them. A photograph from the police command centre at the mine centre shows a plan for 16 August detailing the deployment of Lonmin security agents. The plan also notes the staff’s arsenal, which includes 9mm pistols, LM5 assault rifles and shotguns. The Farlam commission has heard from several parties arguing that they called on Lonmin to negotiate with their employees, including the head of the South African police, Riah Phiyega, and the bishop of Pretoria, Johannes Seoka. However, the situation was complicated. Infighting between rival unions has proved a serious issue in the mining sector, and growing disillusionment with the NUM led to one of Lonmin’s mineshafts, Karee, being left ununionised from mid-2011. It was in this vacuum that, in the month before the massacre, the company had negotiated directly with striking miners at Karee and agreed to an increase in allowances. An internal memorandum from Lonmin officials shows that in July the company knew it was paying its rock drill operators less than other companies. The decision then to engage with workers directly, rather than through the unions, was approved by the executive committee. Farmer, Lonmin’s former chief executive, explained the effort to avoid any trouble, calling it “an attempt to pour oil on troubled water”, but conceded it might have sent mixed messages to the workers. When, in August, the miners attempted to talk directly to management again, the company’s attitude had changed, with executives stating they would only negotiate through the official channels: the then-discredited NUM. Five days before the massacre, the workers marched, armed only with placards and a few sticks, to the NUM offices. Statements from NUM leaders allege that Lonmin security warned the union leaders there that the miners intended them harm. NUM officials opened fire on the unarmed miners, wounding two and effectively breaking off relations for good. Some attempts were made by Lonmin to open communications with the leader of the AMCU, Joseph Mathunjwa. The night before the massacre, he was sent by Lonmin and the police to talk to the miners and was told by the miners to return the next day to continue talks.. However, the following morning, Lonmin cut off all contact through Mathunjwa. As well as the political and industry-wide pressures, Lonmin was facing significant financial pressure in the months before the massacre. Mid-year financial reports, produced a month before the incident, show that Lonmin’s first-half profits had decreased nearly 90% compared to the same period the year before. Production and platinum prices were down, while the company’s net debt had increased by 20% since the year before. To compound the pressures, Lonmin’s bank loan covenants were due to be tested in September. Passing that review relied on the company hitting certain profit margins. “Revenue at the time was not generating the sufficient margin for us to be generating the cash needed, there was a risk that covenants could be breached. Of course when we had the strike for that protracted period of time, that pushed it over the tipping point,” Farmer . When 3,000 Lonmin workers downed tools and went on strike it effectively brought the entire plant to a standstill, and the bank covenants were eventually breached. Although he was ill at the time and therefore not present while the strike was going on, Farmer defends the actions of his former colleagues. “It would be normal for the police to call on the company and ask them to explain as a company what they think is happening … but they would not have sat there and agreed a plan of action for the day with them, because we don’t have that expertise. We’re a mining company, we’re not riot-control specialists,” he said. Lonmin declined to comment on the allegations, stating that it has undertaken not to comment publicly on issues under investigation before it has given evidence and representations to the Farlam commission. This investigation was published in the Observer newspaper.